If you are familiar with the MSQRD video filter app for smartphones, then what I'm about to say won't be too strange to you. If you aren't, let me tell you a bit about the MSQRD app. MSQRD, whose actual nae is Masquerade but was styled to that probably due to its scary nature, is a filter app for selfies and videos, which allows (or allowed) users to add filters and lenses to selfies and videos they took. The app was still in its start-up stages when it was acquired by Facebook for about $117 Million in March. Until recently, nothing was heard of the app, and none of its features were seen integrated into Facebook platforms. Now, Facebook is testing a new feature that puts a camera at the top of News Feed and allows Facebook users to add filters to their selfies. The feature is similar to the selfie filter in Snapchat, and from reports of testers, the feature will have to be enabled by tapping on the camera button, after which it will be enabled automatically each time the Facebook app is started. Though the feature is available for the Facebook app for iOS and Android, it is currently open for testing by iOS users in Brazil and users of both platforms in Canada only. The feature offers filters and face-altering lenses that can be applied as overlay on top of pictures and selfies, just like that in Snapchat. 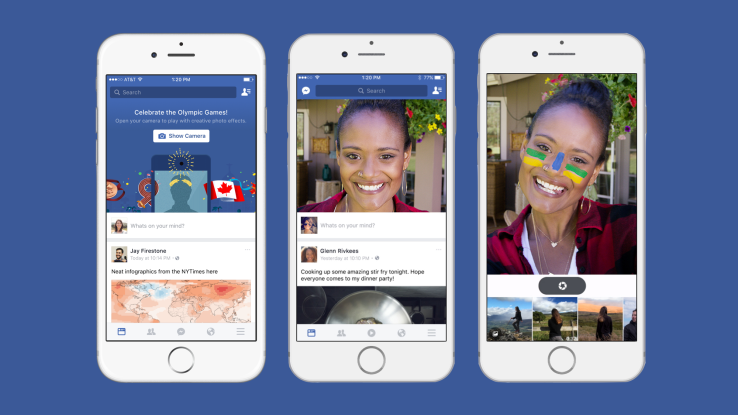 Users in Brazil and Canada already have the ability to apply Olympics-themed filters to their pictures and post them directly to their Facebook profiles. When the feature rolls out officially, it would only be available for the Facebook application for Android and iOS, though, and is likely not to be accessible on the web-based platform.